When an account has an alert on it, a Stop sign is displayed when the record is retrieved. Navigating to an area of the patron record using the navigation buttons at the top of the record (for example, Edit or Bills) will clear the message from view. If you wish to view these alerts after they are cleared from view, they may be retrieved. 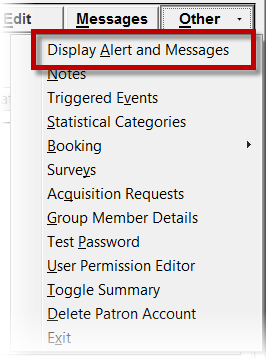 Use the Other menu to select Display Alert and Messages. System-generated alerts: Once the cause is resolved (e.g. patron’s account has been renewed), the message will disappear automatically. Staff-generated alerts: Must be added and removed manually. To add an alert to a patron account, retrieve the patron record as described in the section Searching Patrons. Enter the alert text in the Alert Message field. Save the record. The screen will refresh and the alert will display. Additionally, the patron name will be highlighted in yellow and a note will indicate that there is an alert on the account. To remove the alert, retrieve the patron record as described in the section Searching Patrons. Delete the alert text in the Alert Message field. The screen will refresh and the indicators for the alert will be removed from the account.